Rev. Janet Weiland of the Church of Scientology with other members of the Los Angeles County Interfaith Clergy Coalition are honored at the White House. LA County Interfaith Clergy Coalition and its lead VM are formally acknowledged. Rev. Janet Weiland, Southern California Director of the Churches of Scientology Disaster Response, was honored this fall at the White House, along with other members of the Los Angeles County Interfaith Clergy Coalition, for their work to promote disaster preparedness and ensure the safety of the entire community. Receiving the award alongside Rev. Weiland were Leslie Luke, Deputy Director of Los Angeles County Emergency Management, Bishop Juan Carlos Mendez of Churches in Action, Osas Otasowie of the American Red Cross, Greater Los Angeles Region, Adnan Khan of the Council on Pakistani American Affairs, Curtis Hsing and National Volunteers of the Buddhist Tzu Chi Foundation. The Church of Scientology Los Angeles is an active member of the Los Angeles disaster preparedness Team. Its Volunteer Ministers Corps is on call to respond to any and all emergencies. 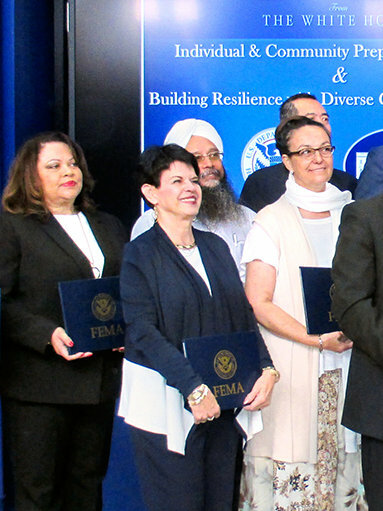 The White House Office of Faith-based and Neighborhood Partnerships which bestowed the award was created by executive order to coordinate community disaster response efforts. It works to build bridges between the federal government and nonprofit organizations, both secular and faith-based, to better serve Americans in need.